It has been a 100 years since the end of the First World War, but we are still learning about the war brides who came to Canada after the war. This blog was created to promote and preserve the history of the war brides from this era. Edith created an aura of mystery about herself in official records, which made it more difficult to find information about her. In most records, she used her initials E. A. and the surname Burrington Ham was often hyphenated, although Burrington was her husband’s middle name, not part of his surname. She often indicated she was a widow who was born in India, although this was proven incorrect. It is possible she was divorced from her husband Harry, who was several years older than her, but a record of their divorce has not been located. Mrs. Burrington Ham was born Edith Alexandra Johnston in England in 1881 to Walter Mowbray Johnston and Fanny Louisa Ellen Dunne. Her parents were married in India in 1876 and several of her older siblings were born there but Edith was born in Hammersmith, a suburb of London on April 10, 1881. [iii] In 1888, she and her sister Irene were admitted to the St. Stephen’s Parochial School in Hammersmith. [iv] Edith was taught at home prior to joining the school. By 1901, I believe she was a sick nurse at the Kensington Infirmary in London. [v] However, more information is needed on this part of her life. Was she a fully trained nurse and where did she train at? The only other indication she was a nurse was in the Militia lists for Canada in 1917. She married Harry Wilberforce Burrington Ham at Pietermaritzburg, Natal, South Africa on February 4th, 1905[vi]. Harry was the son of Henry Hobbs Ham and Maria Lavenia Davis of Long Ashton, Somerset, England. Harry served in during the South African War with the 48th Company, 7th Battalion Imperial Yeomanry from North Somerset. Did Edith also serve during the South African War as a nurse or did she go to South Africa to visit her brother Arthur Johnston at Pietermaritzburg? Their son Arthur Fenton Ham was born in South Africa in January 1906 and in June 1907, the family headed back to England and took up residence in Bristol, England. 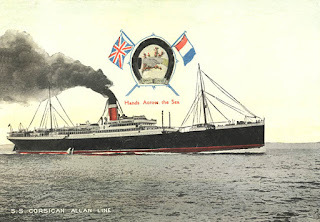 [vii] They travelled from Durban, South Africa to Southampton, England on the ship Walmer Castle which arrived on June 13. [viii] By 1912, Edith headed to Canada with the YWCA and toured the country lecturing at interested clubs across Canada. Mrs. Ham became a YWCA Immigration secretary in Canada and toured the country looking after the welfare of female immigrants, making sure they had places to stay while travelling and they arrived at their employers safely and that working conditions were suitable. In 1913, she became a YWCA National Port secretary at Quebec and was one of the first matron’s placed on ships coming to Canada. [ix] She met with female passengers on board to provide them with information about their destinations, how to travel there and answered any questions they may have. "Immediately on the signing of the armistice, Mrs. Ham saw the necessity of Y.W.C.A. reception huts at the ports of St. John and Quebec; also the need for Y.W.C.A. secretaries on the ocean-going steamers with dependents. An extra office was opened in St. John and also hut work. Buxton was close to Liverpool where many of the dependents travelled to Canada from. Mrs. Burrington Ham travelled across the Atlantic many times during this time period assisting passengers on their journey. Her last trip was on the ship Vasari which travelled from Liverpool to New York in early December 1919. Edith continued to work in the immigration department for a few years but later remarried in BC in 1927. She died in Sidney, BC on December 3, 1951, at the age of 70. [ii] “Touring Province: Mrs. Burrington-Ham Inquiring Into Treatment of Female Immigrants”. 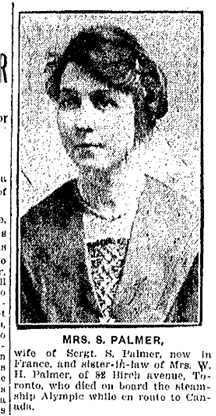 Manitoba Free Press, February 11, 1916, 5 and “Care of Girls: Immigration Secretary Speaks of Good Work Done”. Manitoba Free Press, February 12, 1916, 8. Online at Manitobia.ca on February 20, 2008. [iii] London, England, Church of England Births and Baptisms, 1813-1906. Accessed from Ancestry.com on February 24, 2016. [iv] London, England, School Admissions and Discharges, 1840-1911. Accessed from Ancestry.com on February 24, 2016. [v] Census of England and Wales, 1901: RG 13, Piece 33, Folio 29, page 2. Accessed from Ancestry.com on March 3, 2009. 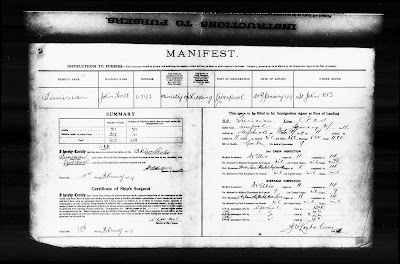 [vi] South Africa, Natal Province, Civil Marriages, 1845-1955," database with images, FamilySearch (https://familysearch.org/ark:/61903/1:1:KDCG-:LCJ: 10 March 2018), Harry Wilburforce Burrington-Ham and Edith Alexandra Johnstone, 04 Feb 1905; citing Pietermaritzburg, Natal, South Africa, Natal Province, Civil Marriage 1845-1955; National Archives and Records Services of South Africa, Pretoria; 1,795,040. Accessed at FamilySearch.org on March 19, 2014. [vii] British Phone Books, 1880-1984. Accessed at Ancestry.com on March 17, 2016. [viii] UK, Incoming Passenger Lists, 1878-1960. Accessed at Ancestry.com on March 3, 2016. [xi] Bio of Mrs. E.A. Burrington-Ham from the article, “City Association Council Meet Two Days at Y.W.C.A.” Calgary Herald, May 17, 1919, 6 & 14. It has been 100 years since the Spanish Flu pandemic of 1918 killed millions of people worldwide. Some families and communities were devastated by the virus, while many others survived the deadly disease without incident. 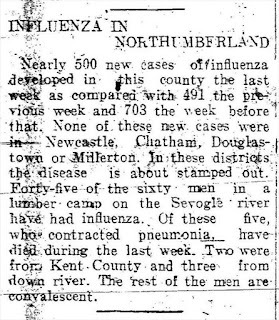 I’d like to remember the members of one New Brunswick family who was torn apart by the pandemic. British-born Maud Blanche Cornish was born on June 13, 1895, in Bristol, Gloucestershire, England the daughter of Samuel Cornish and Caroline Horne. She married Canadian Expeditionary Force (CEF) soldier William Jonathan Carson (Regimental # 42) from Holtville, Northumberland, New Brunswick in December 1917. William joined the CEF in April 1915 at Fredericton, N.B. 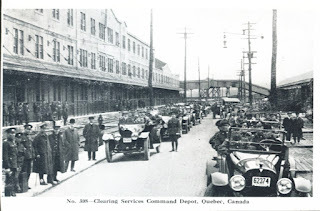 and went overseas with the Canadian Army Service Corps (C.A.S.C) but had transferred to the Canadian Forestry Corp by 1917 when he married Maud. Maud Carson was several months pregnant when she travelled to Canada with her new husband on April 24, 1918, as a war bride. Her husband was returning home as he was longer fit for service. 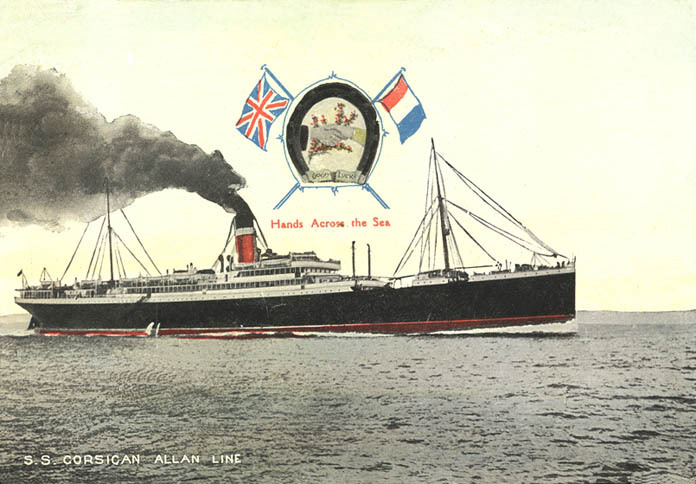 They sailed from Liverpool on the SS Aquitania and landed at Halifax, Nova Scotia at Pier 2 on April 29, where they boarded a train to her new home in Holtville, N.B. Maud obtained an Emergency Certificate of British Nationality for Canada in order to travel to the Dominion during the war. The harbour in Halifax was still being rebuilt after an explosion rocked the city on 6 December 1917. Two boats collided in the harbour; one was a munitions ship loaded with explosives destined for the battlefields in Europe. It destroyed much of the downtown core around Pier 6, killing over 1,900 people and injuring more than 9,000. Pier 2 also sustained damage and was unable to support the large numbers of passengers that it had in previous years. Maud settled into life in the small town of Holtville to await the birth of her first child. She was one of the many people who was counted during in the Canadian National Registration of 1918 which was taken on June 22, 1918. Maud Carson gave birth to her only son, William James Carson (“Jim” as he was known) on November 6, 1918. Tragically, life for this family would be forever altered. 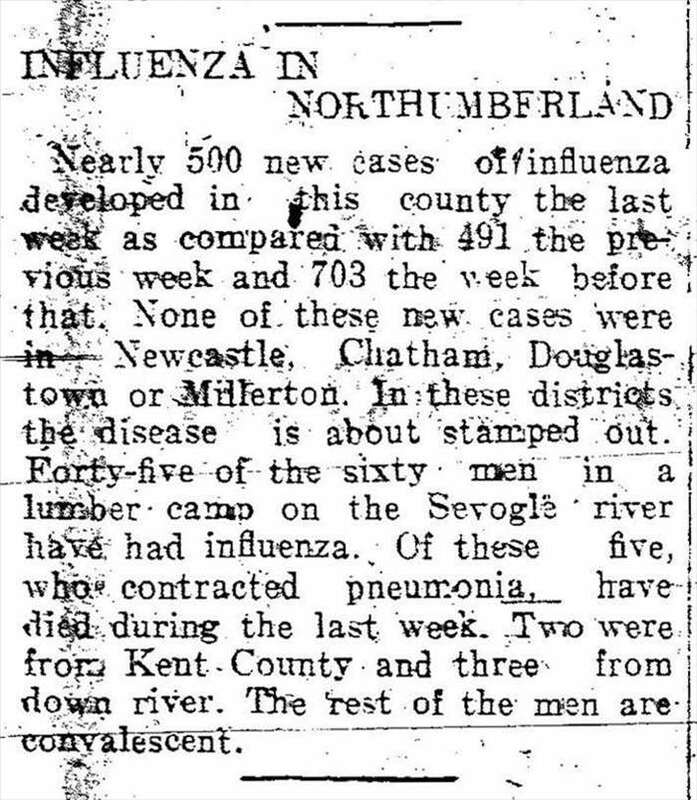 Influenza swept through their household killing her father-in-law on November 4. Both Maud and her husband William contracted the flu shortly after and succumbed to the virus about a week later, leaving their only child an orphan. Records indicate Maud gave birth while fighting the virus. The only other person who lived in the house at the time was Christina Carson, Maud’s mother-in-law. She survived the ordeal and went to live with her daughter. A reverend from the church in nearby Boiestown, N.B. took the young orphan into his household but refused to surrender the infant to his family. A custody battle ensued. William’s sister, Christina Plume, travelled from nearby York County to fight for custody of her nephew. She applied for guardianship of him, which she was granted on 12 May 1919. William’s WWI personnel file shows that Rev. Smith of Boiestown was issued a cheque as the guardian of William and Maud’s son in the amount of $424.90 in April 1919. Her lawyer, Charles D. Richard, of Fredericton advised that with guardianship papers in hand and a provincial constable at her side, she should be able to obtain custody of the child by any means possible, given that “you do not commit any definite act of violence or assault” in order to do so. Christina Plume finally gained custody of her nephew six months after his birth. Fortunately, his aunt was able to provide him with a loving and stable household despite that the fact that her husband Samuel died five years later after a threshing accident on the farm. The following poem was written about the death of William Carson and his wife Maud by a neighbour of Plume family, Mrs. James McKinnon of Tay Falls. Who had chosen to bear his name. To sleep in a foreign grave. And left a baby boy. To the better world above. And his little English bride. Jim Carson grew up with many siblings. Christina and Samuel Plume had ten children of their own. During WW2, he enlisted in the Canadian army and served overseas with the Royal Canadian Engineers (RCE). While overseas he was able to meet his mother Maud’s siblings and spend time with them. Dear Momma: just a few lines to let you know that I am well and hope this letter finds you all the same how is Mack getting along with the work suppose Bert is helping him have you sent any smokes yet hope you have as I am out of tobacco now and this English tobacco is so dear and besides I don’t like it either have you got any of my letters yet I sent you an air mail letter just after I arrived here so I hope you have it by now I was up to my aunt last week end and they are all well they don’t live far from here my Bond will be paid up this month so you let me know as it should be there by the middle of November how is Ella and Margie suppose they stay with you most of the time I like this country but at the same time I would like to be back in Canada but o the war will soon be over and then I will be home I have eleven months in the army to day well Momma I guess I have said all for this time so will close. Jim survived the war and returned home to his family. He married Rhoda Jordan in 1950. They had four children together. Jim died in October 1992 at the age of 73. He is buried at the foot of his parent’s grave in the Cameron Hill Cemetery in Holtville, N.B. He was not able to spend this lifetime with them but they will be together for all eternity. 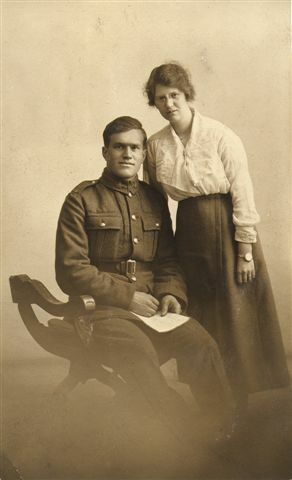 Rosa Bertha Jadwega Falecka married Calgary soldier Arthur Robert Lambert (Regimental # 447116) of the 31st Battalion in the Parish church of Clapham in London on 22nd January 1919. During the war, Rosa had reportedly been traumatized by a bombing near her home in London. She likely suffered from a stress disorder after the incident. She came to Canada on the ship Corsican in August 1919 but her health suffered further and she was admitted to the Jeffrey Hale Hospital in Quebec after the ship arrived at the port and suffered a fatal relapse. She was 35 years old. 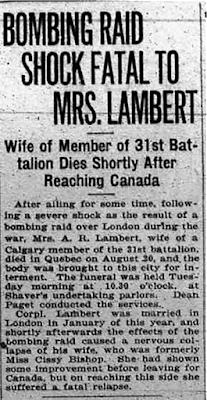 Her husband had her body shipped to Calgary for a funeral and she was buried in the Union Cemetery. Sadly, she never had the chance to make a new life for herself in Canada. I haven't located a death record to learn her cause of death. I would like to confirm what she died of. If anyone has any further info on her, I'd love to hear from you. Note: The newspaper report above lists her name as Cissy Bishop. Her name was indeed Rosa Bertha Falecka, wife of Arthur Lambert of Calgary. Canada Passenger Lists, 1881-1922. Database with images. FamilySearch.org http://FamilySearch.org: 27 August 2018. Library and Archives Canada, Ottawa, Ontario. 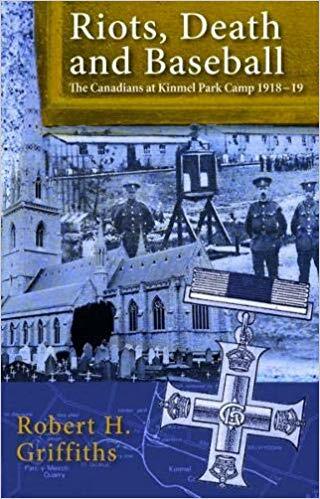 Morris, Philip H. The Canadian Patriot Fund, a report of its activities from 1914-1919, 48. 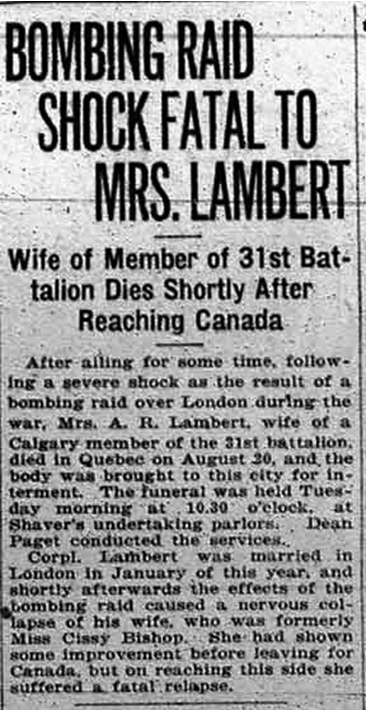 Bombing Raid Shock Fatal to Mrs. Lambert. Calgary Daily Herald, August 26, 1919, 19. A great resource that many people are not aware of is the war diaries for ships during and after WWI. 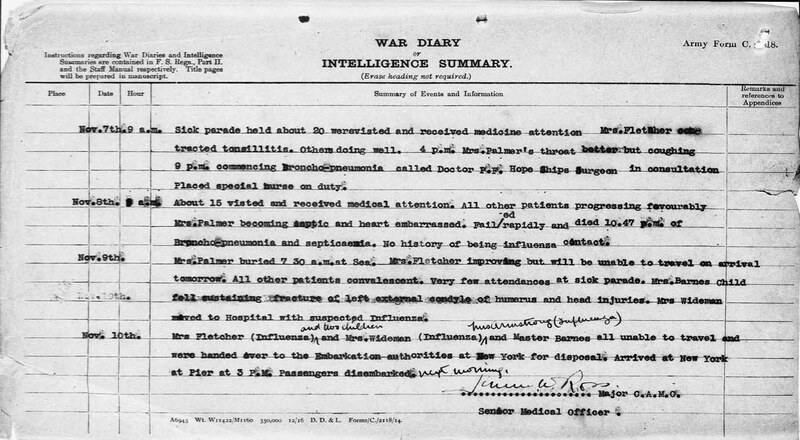 If your war bride travelled on a ship that contained military men, you might be able to locate a war diary for their sailing at Library and Archives Canada in War Diaries. Some are online, while others are available on microfilm only. To do a search for the diaries for ships do an Advanced Archives Search for War Diaries and add the name of the ship on the second line in the search function. They show up under War Diaries - Progress Charts - Olympic for example. Lily May Young married British-born Canadian Expeditionary Force soldier Samuel Palmer (Regimental #778984) in 1918 in England. Sam was a widower with three young children back home in Ontario. Not long after she married, Lily left from Southampton, England on the Olympic on 1st November 1918, intending to travel to Toronto and set up a house for her husband and his family while he was still overseas. Lily travelled to Canada during the height of the Spanish flu pandemic of 1918, so I was interested to learn whether the cause of her death was influenza. The passenger list for the Olympic shows her name is crossed off and the info "died at sea" is written above her line on the manifest but no cause of death is listed. In order to confirm how she died, I needed to find an alternative source of information about her death. That is where the war diaries come in useful. This is one page from the November 1918 sailing of the Olympic. 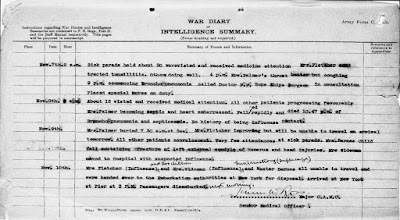 The diary records that Lily took sick with a septic throat and was placed in an isolation hospital on board on 4th November. She died on 8 November 1918, at age 23 of Broncho-pneumonia and septicemia and was buried at sea the next day. The ship landed at New York two days later on the 10th. Sadly, she was just the first of many young war brides who died during their journey to Canada. Officials on the next sailing of the Olympic issued gauze masks to the passengers in order to keep the outbreak on board to a minimum but it didn't stop the deaths of a number of war brides coming to Canada during the influenza pandemic of 1918-1919. Canada Passenger Lists, 1881-1922. Database with images. FamilySearch.orf http://FamilySearch.org: 27 August 2018. Library and Archives Canada, Ottawa, Ontario. Sand Point, New Brunswick Harbour circa 1909. Annette Fulford collection. It was on 10 February 1919, that the first official ship carrying military dependents - war brides and their children, arrived at Sand Point in St. John, NB. Many war brides had travelled to Canada since 1917 but this was the first sailing where the ship was just for dependents. The Tunisian carried 711 adults and 202 children under 14 years of age and sailed from Liverpool on 31 January, landing 11 days later. Tunisian Manifest Info. Library and Archives Canada. All soldiers’ dependents were provided with free third-class passage aboard the troopships, except for those who paid to travel in a superior class. 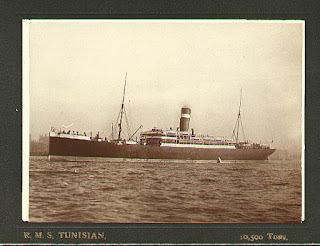 Unfortunately, obtaining a superior class on board usually meant they had to travel to Canada at later date. And when given the option to wait until later to sail, most chose third class passage in order to get to Canada as soon as possible with their husbands. Third-class is essentially steerage, where the cheapest accommodations on the ship are housed. This is where the majority of the passengers were located on the ship. The rooms are below deck and were very crowded. In some cases, there is no proper ventilation to air out the stale air, the smell of seasickness or dirty diapers. The rooms were very basic, often containing only two or four berths, which included bunk beds, and a wash basin. Steerage also had limited toilet facilities for the vast amount of passengers it contained. It was inadequate for women travelling with small infants. At the beginning of the repatriation scheme, there are many complaints in the immigration files about conditions in the third-class accommodations as most families were not used to travelling in steerage. It was an ordeal for most travellers. Once on the ship, though, most passengers preferred to be on deck in the fresh air, not stuck in their cramped berths. Another common complaint was the lack of seating on deck for those who wanted to escape their berths. There were additional complaints about seasickness, overcrowded, dirty accommodations, and lack of amenities. Many of these complaints were dealt with while on board, while many other complaints were aired in local newspapers after the voyage. Mr. Dyson who was a travelling representative for the Returned Soldiers' Commission, reported that "there was a good deal of sickness among the women and children owing to the conditions they were subjected to on board the steamer." Due to rough seas, lavatory water soaked the floors in steerage. However, this information was not confirmed in any of the other news reports about the sailing. Gladys Kendrey, a war bride who was headed to Peterborough, Ontario, noted in a letter to her parents in England a month later, that the sailing was uncomfortable but she did not expand on the subject further. It was possible that she was trying to appease her parents so that they would not worry about her. Her father had sent a news clipping from a British paper with the headline "Brides Pelted with Refuse." She was adamant that this was not the case. Gladys was concerned about the many war brides who had yet to travel would read this and change their minds about coming to Canada. She told her parents that her arrival in Canada was very pleasant. They had expected a cool reception from the Canadians. Once they made it through the immigration process, they were treated to free refreshments from the Salvation Army, Knights of Columbus War Activities and Y.M.C.A, in a large hall. They had time to freshen up and were shown a place for their children to take a nap while they waited for the trains to be loaded with passengers. If someone was ill, they could be seen by a nurse. On the final leg of their journey, young children and the ill were given special treatment while travelling by train. Each train carried a Red Cross nurse. Once they arrived at their final destination, the local Rotary Club took them home in cars. Cars taking soldiers home. Annette Fulford collection. Sadly, Gladys Kendrey didn't stay in Canada for long. She and her husband Roscoe went to the US where her husband died in 1930. She returned to England with her young son. Donald Walker Kendrey enlisted in the British army during WW2 and died on 28 November 1944. His name is listed on a memorial in Singapore for the soldiers and airmen who have no known grave. Grace and Hugh Clark, taken in England. Annette Fulford Collection. On 17 September 1919, my grandparents, Hugh and Grace Clark, boarded the RMS Melita for their journey to Canada. Hugh was a returning Canadian soldier; Grace, his war bride. Grace would document their crossing in a letter to her parents back home in England. It chronicles her maiden voyage on a troop ship carrying returning Canadian soldiers, military dependents, and civilians after the First World War. The original letter (or as she describes it - her "epistle") was sent to her family back in Sheffield, England and it describes the events that occurred during her trip on board the Melita. It was written in pencil on both sides of 5 x 8-inch paper, more than 68 pages in all. Although some of the pages are missing or tattered, the majority of the letter is still intact. It became evident as I tried to learn more about the war brides from the Great War, that they were barely a footnote in Canadian history. Not many stories could be found, and the ones that I did locate were in local histories. 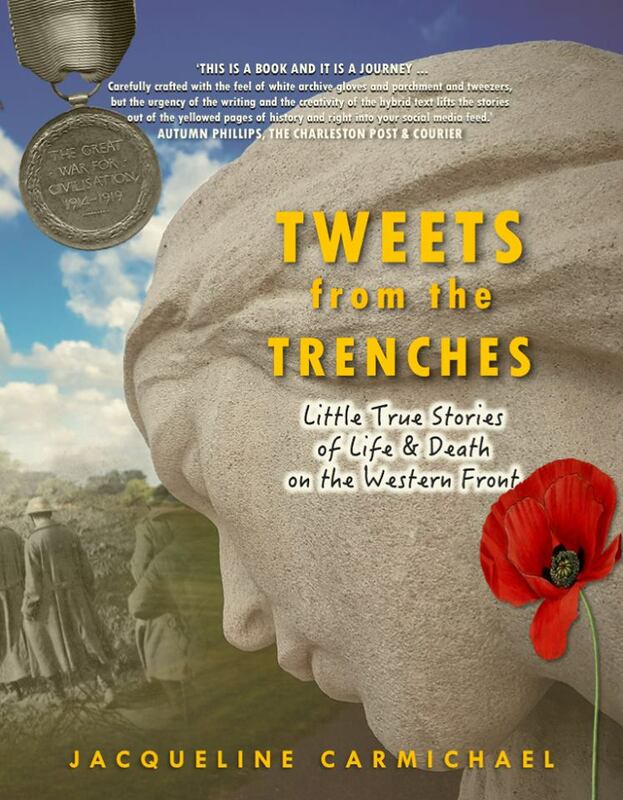 Fortunately, a few of these war brides wrote about their experiences for a new generation of war brides arriving in Canada after WWII; yet their collective history remains to be told. Thousands of war brides travelled to Canada after the First World War in an immigration scheme that was paid for by the Canadian government. 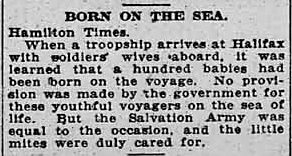 While the war brides were not supposed to travel during the latter stages of their pregnancy, a number of war brides gave birth while on their journey to Canada. In April 1919, the newspaper reported that two war brides on the Grampian gave birth to sons. However, records show that Mrs. Susan Riddell had a son, while Mrs. Germaine Durand, a daughter. In September 1919, while travelling to Canada on the ship Cedric, Mrs. Winifred Orchard, wife of Private Frank Orchard, gave birth to a son. He was christened “Cedric”  after the ship and the captain was chosen to be his godfather. He gave the couple $50, while the passengers chipped in and gave them $95. It’s a good thing he wasn’t travelling on the Grampian or Metagama otherwise he might have a very different name! I found this article about another ship that had quite a few births on board but I have not been able to learn just what ship it is yet. If anyone finds a ship landing at Halifax in January 1919 with a large number of births on the manifest, send me an email at wwiwarbrides@shaw.ca. I'd love to track the families. He is listed as Franklin Cedric Orchard, 3 days old, on the ship’s manifest.